Most of the European sport horse registries – Dutch Warmblood, Belgian Warmblood, Oldenburg, to name a few – keep painstakingly detailed databases, each of which contain similar information. To keep our review manageable, this article will take a closer look at the sirebook published annually by the Hannoveraner Verband E.V. This detailed 700-page volume includes all current approved stallions, their breeding value estimation based on the assessment of their daughters, and their progeny’s show records. It also introduces the newly-approved stallions from the previous year. 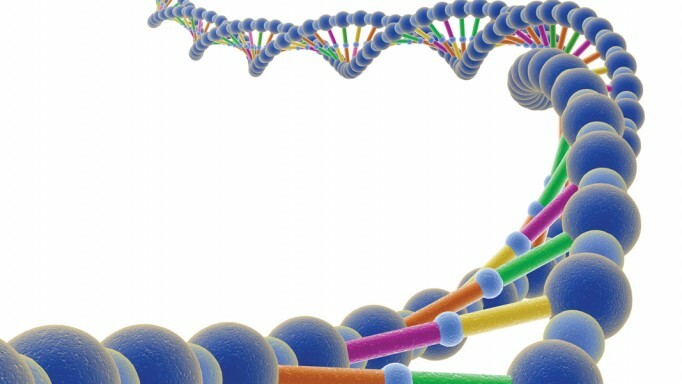 There are “top lists” for the leading sire by breeding value in each sport – all with a goal of making developments in the breed transparent while providing the ultimate amount of information to their breeder. Dr. Ludwig Christmann of the Hannoverian Verband developed the club’s breeding value index and is now responsible for the development of Hanoverian breeding outside Germany. “Our database is outsourced,” he says. “We are in the lucky position that there is a database specialised in animal production just across the street from our office called VIT.” VIT is a software developer and information service which provides database management for the animal breeding industry, tabulating everything from auction results, to scores from elite and state premium mares, to estimation of breeding values. Other associations who use VIT’s services include the Westphalian Studbook, Landgestüt Celle and the Baden-Württemberg Breed Registry. • Number at the top right is the Universal Equine Life Number. 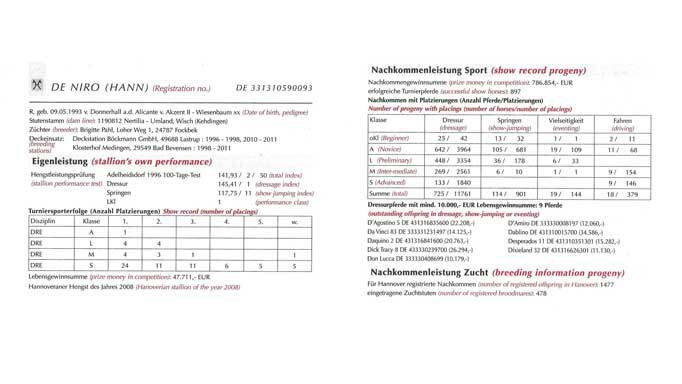 • Eigenleistung: This is the stallion’s own performance stats; in this case, he was licensed in ‘96 as a three-year-old, did the 100-day test, and his total score was 141.93 – he was second out of 50 stallions. His dressage score was 145.41 – first out of 50. His jumping score was not nearly as good – 117.75 for 11th place. • The next box is his show record, all dressage placings in this case. Below that is how much money he won in competition and the fact that he was Stallion of the Year in 2008. • Licensed sons with their life numbers: “You can get a feel for how good they are,” by researching them in the sire book. So what can breeders on this side of the Atlantic take away from all this? Boyd suggests that it’s never too late to start.“Even in Germany, given their history, this (database) has all happened within my time in the sport. The first stallion book came out in ‘98 or ‘99. This mare line (info) is only two or three years old now. They’ve had the same problems we’ve had here; they’ve just had them earlier. As George Morris so succinctly put it, “…the Europeans are so far ahead. It is such a big industry … so professional, so scientific. 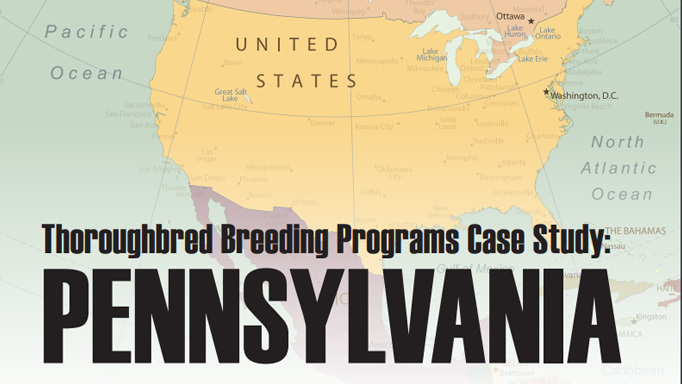 Yes, we will do our part in breeding, but I don’t see how we could ever catch up.” This is especially true in Canada, where, without a traceability program in place, and despite a breeder’s best efforts, a stallion’s progeny are often difficult or impossible to track once they have been sold. 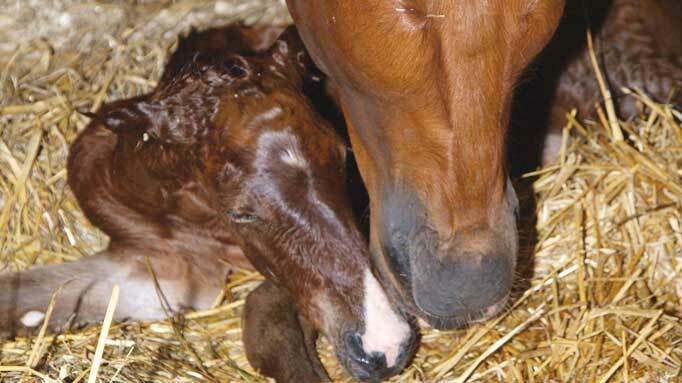 North American breeders would do well to closely examine the methods and practices that have been modus operandi in the European sport horse registries for generations, get on board with life numbers, and start now to develop their own comprehensive databases if they want to remain competitive on the world breeding stage.